A Daily Creativity Journal: Make Something Every Day and Change Your Life! Your creative spirit is begging you to give it a new challenge. Your opportunity is here; will you take the plunge? The concept of Noah Scalin's "365 method" is simple and inspired: Choose a theme or medium, then make something every day for a year. Noah made 365 skull-themed projects . . . now he invites you to choose your obsession and get creative! Whether you're drawing or using photography or collage--you're strengthening an inner creative muscle. And in this new edition, there's even more to inspire you! You'll find a bonus month of new prompts--now there are more than 400 ways to jumpstart your creative spirit and get inspired! 365 New + Expanded Edition is meant to be marked up and scribbled in. It has space for journaling, sketching, and jotting down ideas--the perfect place to experiment with choosing subjects that matter to you then creating a massive body of work. You'll see how the "365 method" has inspired others, with features on artists and crafters who took the 365 challenge. You'll also have the opportunity to master new techniques you can then incorporate into your projects, including quilling, clay-making, paper pop-up engineering, and more. 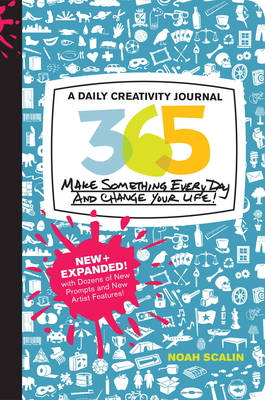 With 365 New + Expanded Edition, you'll get charged up, messy, and inspired, and you'll see how making something every day can change your creative process--and your life--forever!